Choosing the most appropriate sofas and chairs for your home is an important decision, and it should not be complicated, but there are a few suggestions we can offer that might help to make the process a little easier. Here at Sofas & Stuff, we can help ensure your selection is exactly what you want and that you are happy with your choice in the long term. 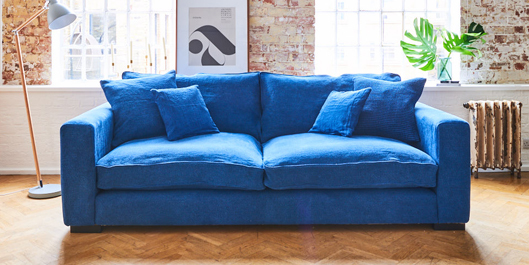 We make a special effort at Sofas & Stuff to give as much support as possible at the early selection stage, supplying free fabric swatches to help you find the exact match of fabric for the sofa style of your choice. We offer sofas and beds in a range of sizes, from large sofas, king size beds to 'snugglers' and single beds, so there is something for everyone and for every size of room. Combining a mixture of different styles of sofas, chairs and beds may also offer a solution where space is at a premium. Full dimensions are given for all sofas, chairs and beds. 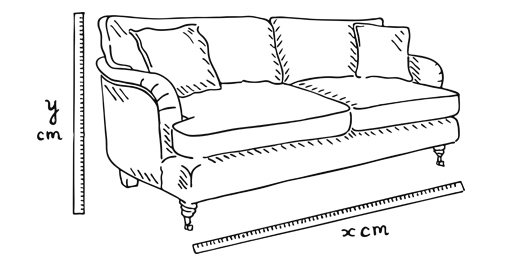 Allow for the space taken up by the recline of sofas (i.e. the area taken up by the angled upper back) when calculating space requirements. It may be helpful to plot out a grid square plan of your room on paper or use objects, tape, newspapers or cardboard cutouts so you can explore options that will allow adequate space for both furniture, tables, leg room, traffic areas and clearance from heaters and fires. Obviously larger sofas are suitable for bigger spaces, but there are also matters of proportion to be considered, such as the height and depth of sofas and chairs - higher backed chairs, for example, look better in high ceilinged rooms; sofas with a lower profile can help make rooms look more spacious.